Butler celebrates graduates at 90th annual commencement. 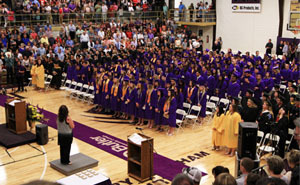 Butler Community College held its 90th annual commencement ceremony on May 13. This spring, Butler graduated 641 students. The keynote speaker for the evening was Dr. Greg Joyce. Joyce attended Butler in the early 70s. He then went on to become an optometrist and practices in El Dorado. Recently honored as the Butler Foundation’s 2017 Distinguished Alumnus, Joyce said how fortunate he was to have come to Butler. Butler also took time to recognize the Hubbard Award of Excellence winner, Olivia Jacoby of Andover. Jacoby, who plans to continue at Butler in the BEST program, will use the $15,000 scholarship toward her bachelor’s degree in elementary education from Emporia State University while attending school on the Butler campus. After being told that she would not attend college, Jacoby excelled. She graduated with an Order of the Purple honors. Runners up for the Hubbard Award were Payton Dahmer of Nevada, Mo., who plans to attend Kansas State University and major in agriculture, Madalyn May of El Dorado, who will transfer into the pre-veterinarian program at Kansas State, Sarah Slack of Conway Springs, who will major in music education at Wichita State University and Whitney Whitaker of Atascadero, Calif., who will major in animal science at Kansas State. Both Dahmer and Whitaker were named national All-Americans in Livestock Judging.